For the past week or so the song “Spotted Cow” from British folk-rock legend Steeleye Span’s Below the Salt album has been going through my head, quietly begging me to be the name of a new beverage. 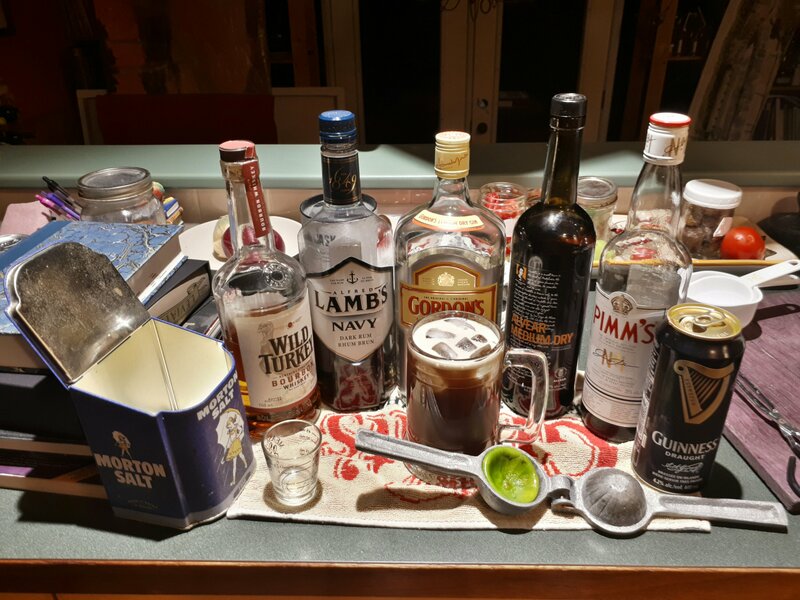 As regular readers (both of them) will know, I’ve been fiddling about with beverage recipes the last while, like my Mazal Tov Cocktail, my Guavalhalla, and of course, my Arthur Gordon Pimm’s of Nantucket. I’ll not share my mojito recipe except in person, but I will cautiously share my plan for the Spotted Cow. Probably obviously, the Spotted Cow is a variation on the venerable Brown Cow: Kahlua and cream or milk. But, how to make it spotted? 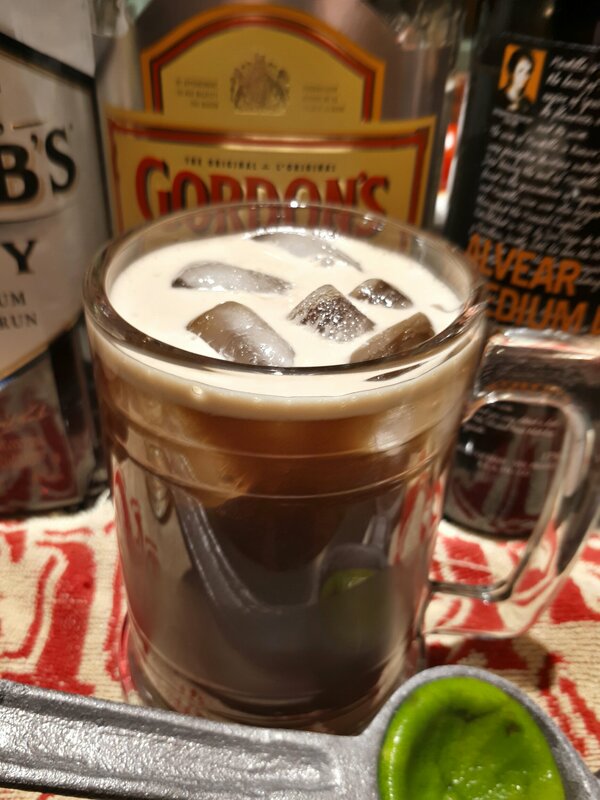 How to keep the Kahlua as brown islands in the stream of white cream? I thought for a day or two about some sort of molecular gastronomy solution involving edible alginate, etc., but that seemed too extreme. 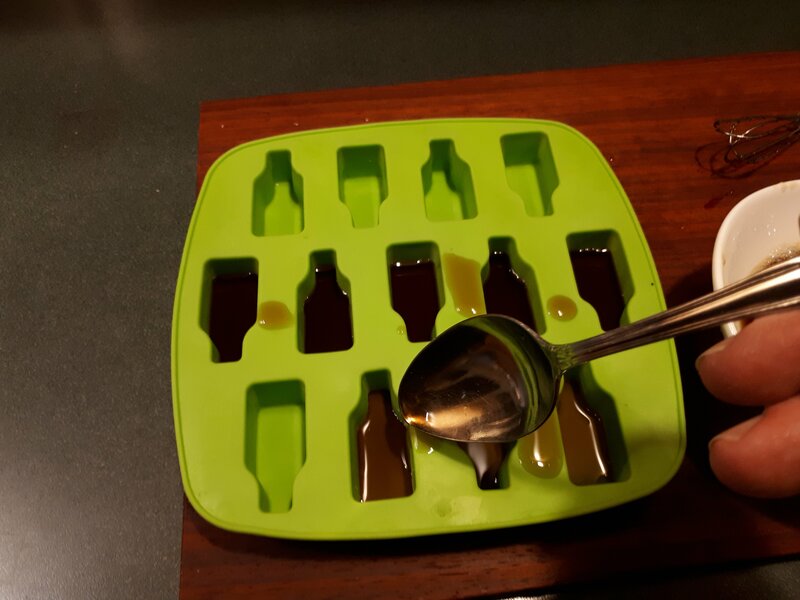 Finally memories of neighbourhood block parties flooded my mind: Jell-O Shots! slid it into the fridge and stepped out into the frosty evening to walk to 7-Eleven for a bit of cream. 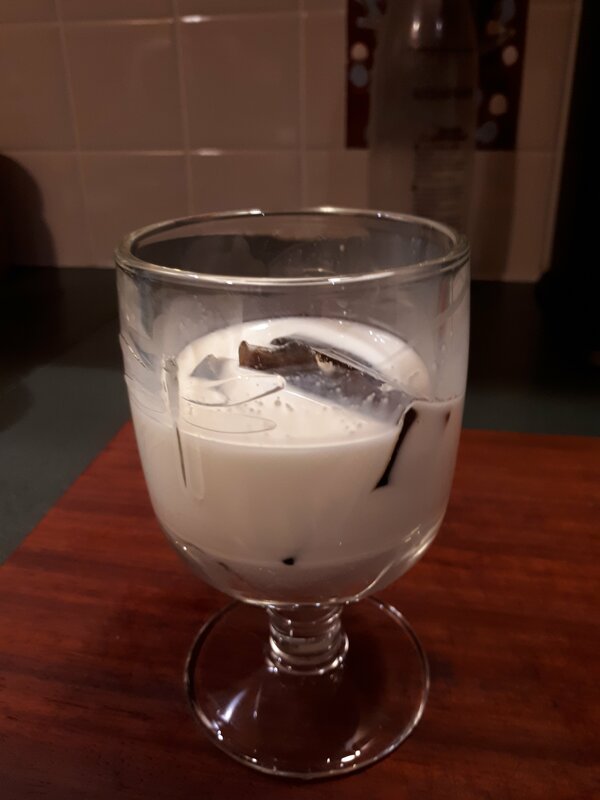 and into the waiting glass of cream. I ended up enjoying it with a spoon, as though it were some sort of dish of strawberies and cream going all boozy coffee and Jell-O and my quiet winter evening had been transformed into a strange James Bond morning in Istanbul directed by a late-period Stanley Kubrick but in the hotel roomat the end of 2001. Many years ago I heard of an intimidating beverage called “The Hangman’s Blood”, ostensibly invented by Anthony Burgess. 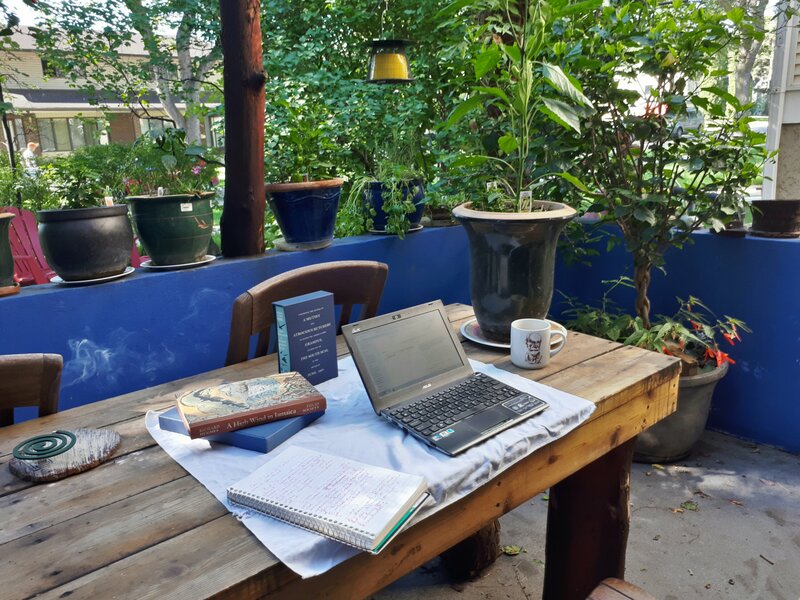 Burgess called the Hangman’s Blood “a beery concoction of many liquors and stout and champagne.” Sometime after hearing of Burgess’ “invention”, I was quietly and purely by chance reading an odd children’s novel called “A High Wind in Jamaica by Richard Hughes. 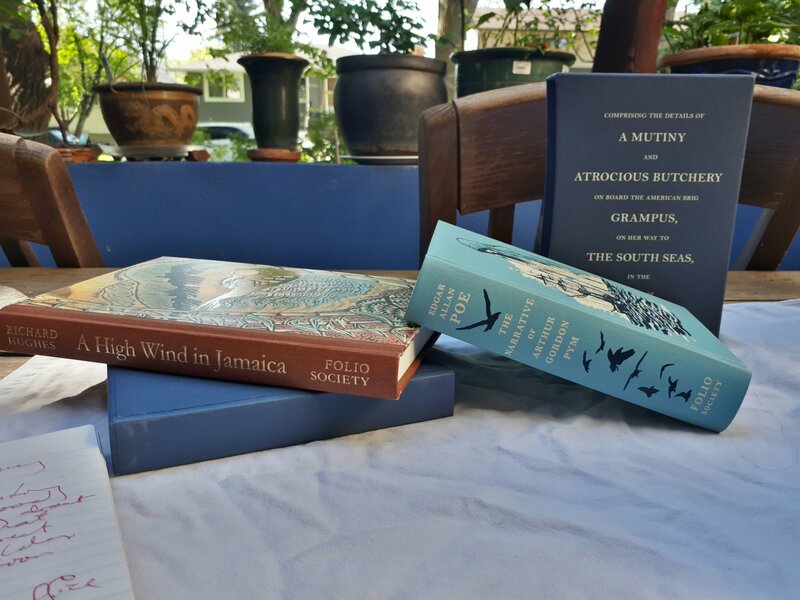 “A High Wind in Jamaica” was published in 1929, a month after Burgess’ twelfth birthday. I don’t know if young Tony Burgess read Hughes’ book, but . . . When I realized Hughes’ precedence over Burgess, I edited the Wikipedia entry on Hangman’s Blood to set the record straight. You’ll have to take my word for it that it was me. A healthy pinch of Salt — for the sea spray over the bow in a Southern Ocean gale. I’m happy with it. Definitely an ocean flavour to it, and something mysterious and unidentifiable but pleasant. Unusual, but not a Poe Horror. The aroma may have a little something of the (watery) grave about it, but it’s strangely pleasant. And there’s a distinct earthiness about the flavour. The salt is necessary. 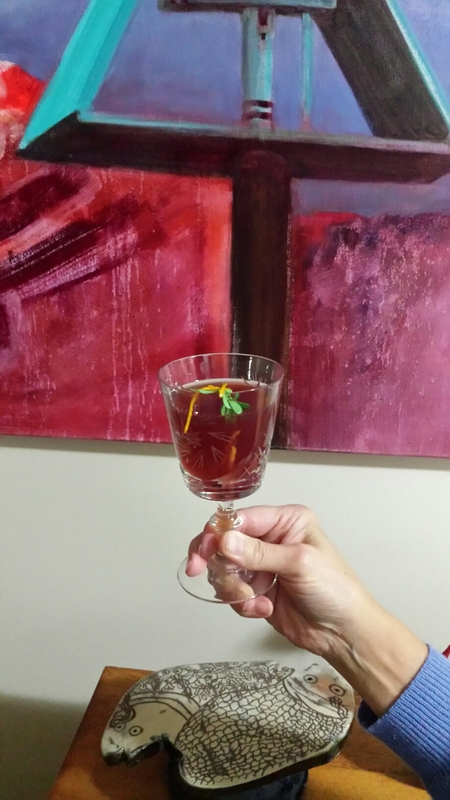 This is certainly a drink to savour while savouring Mr. Poe’s writing! A note: I did not make my Arthur Gordon Pimm’s of Nantucket with the double measures Burgess recommends for his version of the Hangman’s Blood. Singles seemed adequate and more in keeping with the temperance Mr. Poe strived for but did not always achieve in his life. 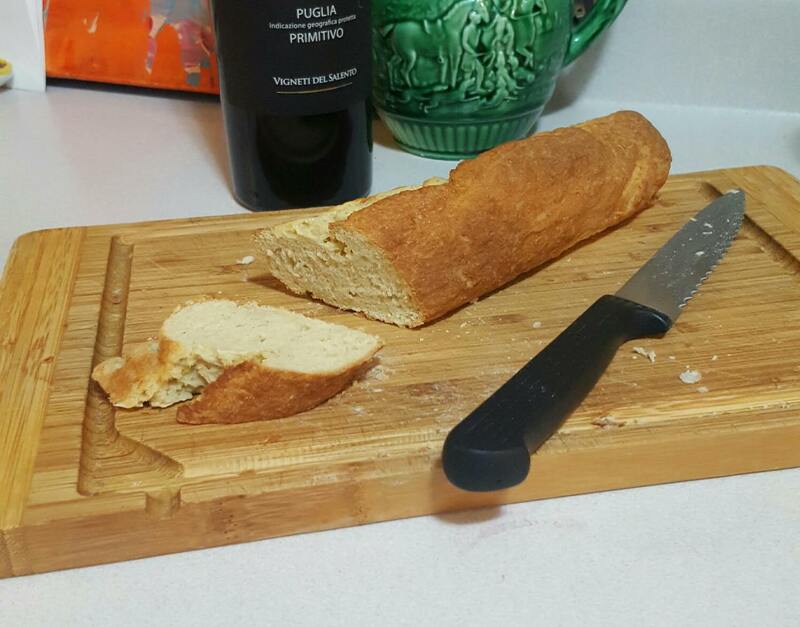 I never thought I’d be bothered with the gluten-free thing, but, when someone close has a number of food-sensitivities and the request is made to try one’s hand at a gluten-free baguette for a small family dinner, suddenly one is excited by the new challenge. So, with about two days’ notice, I had to draw on all my experience and knowledge of bread baking and at the same time temporarily forget a lot of what I knew and ignore my expectations and instincts. The big challenge of gluten-free yeast bread baking is the fact that gluten is the almost-magical ingredient that makes real bread possible. Nothing in the world has quite the properties of that mix of proteins called “wheat gluten”. Wheat gluten has unparalleled ability to form airtight, extremely elastic little bubbles. Even rye gluten is not a match for the gluten of wheat. 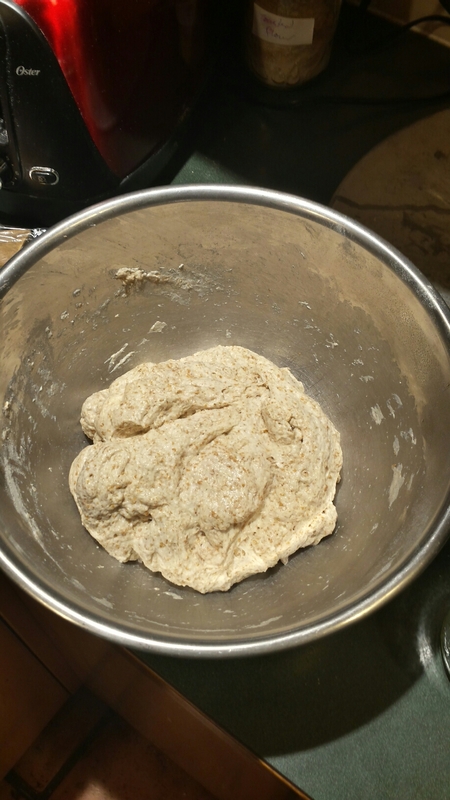 If you try making a loaf of 100% rye bread, look closely at the dough as it rises, particularly if brushed with oil. You will see — perhaps even hear — bubbles escaping to the surface of the dough. This is why 100% rye bread is inevitably more dense than a good wheat bread. So. No gluten. No eggs. What’s left? Well there’s this interesting product that is derived from what amounts to bacterial snot. Xanthan gum is a polysacchride, basically a charbohydrate polymer that is secreted by the bacterium Zanthomonas campestris. The gum was discovered by Allene Jeanes and her team in the mid-20th century and approved for use in foods in the U.S. in 1968. It’s a relatively new and very versatile food additive manufactured in a simple process not unlike brewing beer or, indeed, bread making. A vat of feedstock is inoculated with the bacteria, the concoction is allowed to ferment for a few days, and then a load of isopropyl alcohol is dumped into the vat (that’s the part that makes me smile at the “natural” label on my package of xanthan gum). 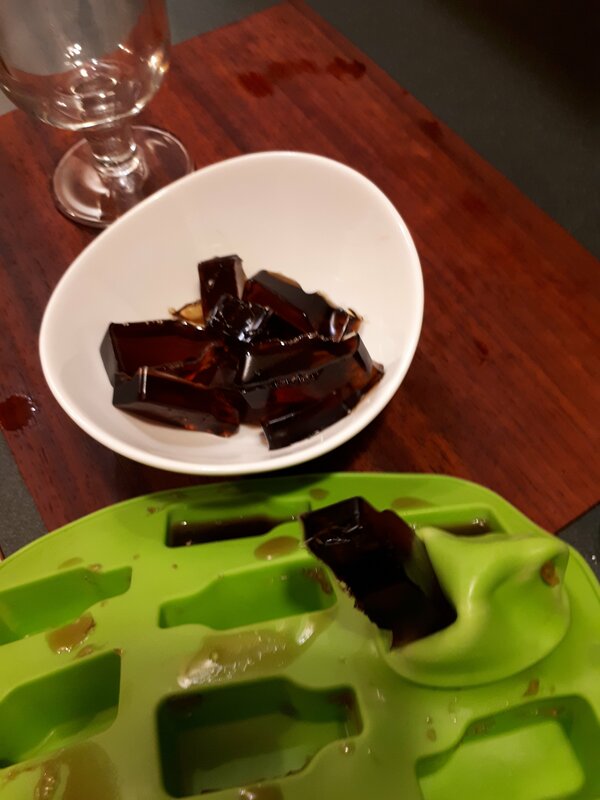 The alcohol makes the fresh snot solidify and sink to the bottom of the vat. The gum in rinsed, dried, and ground up for sale in expensive little packets at your local Green, Organic, Whole, Vegan, Gluten-Free Health food store. 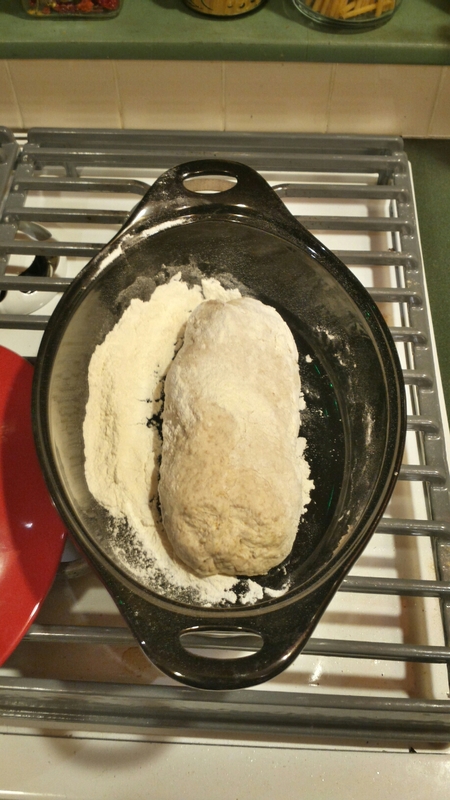 Without the xanthan gum, my project could never have risen much above terribly disappointing hardtack. And if I didn’t talk much about the isopropyl alcohol bit, I might be able to get away with it. I skimmed a few recipes online and read the back of my sack of Bob’s Red Mill Gluten-Free All Purpose Flour — mostly chickpea flour so watch out for gas if you eat a lot of this bread. 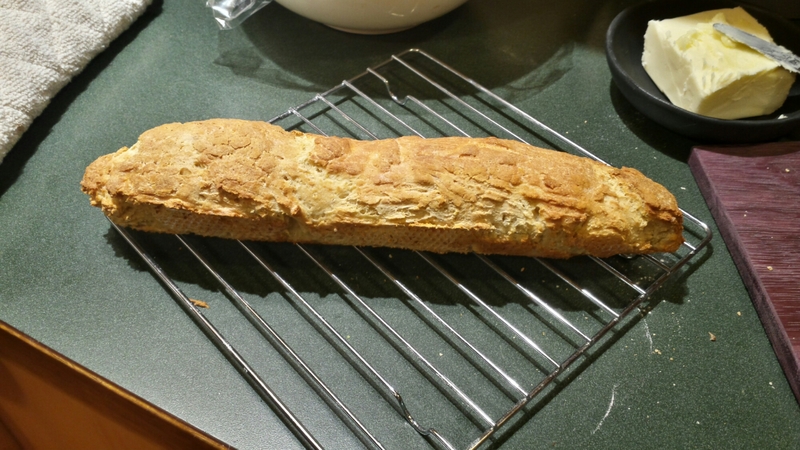 Then I laid out my basic recipe, based mainly on my own real baguette recipe. 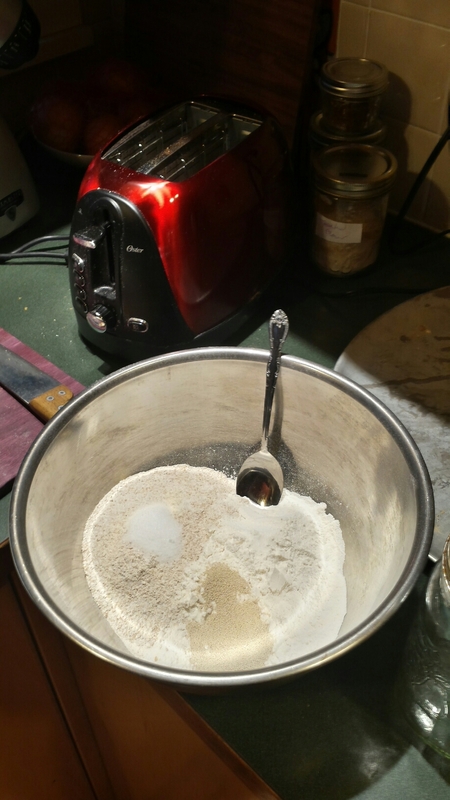 I used a cup of Bob’s flour, quick rise yeast, salt, two teaspoons of xanthan gum, half a cup of water and a splash of lime juice because it was handier than lemon. I was aiming for something like the texture of real bread dough, but the result was a little crumbly and not at all elastic. After a bit of time to rest and maybe rise, I threw it into a 450 degree oven for twenty minutes and pulled out — a bread stick! It was dense but tender and chewy with good flavour, but not a baguette by any measure. For the second attempt, I used the same proportions except for the water. 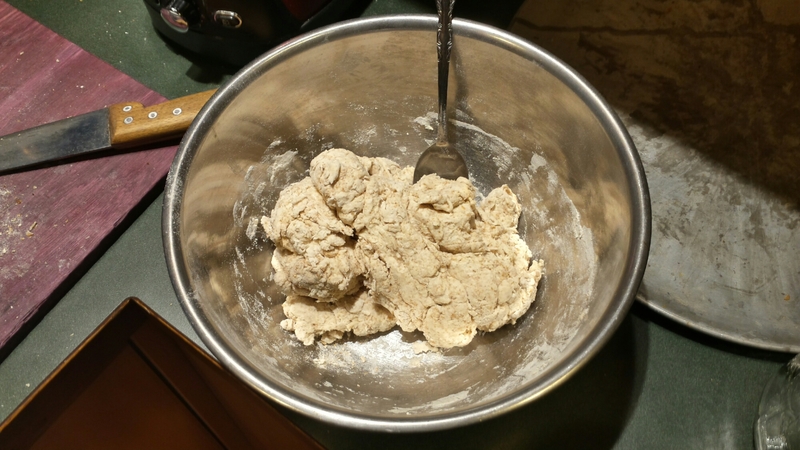 I used a full cup of water and made what I would call a batter rather than a dough. I oiled the top of the loaf and left it to rise. I could see bubbles popping through the oil. When it was close to double in size, I gave it 20 minutes at 450 degrees and this time I had something approaching an actual baguette! And it tasted good! It wasn’t really what I would call bread, but it was a quite satisfying product in itself. 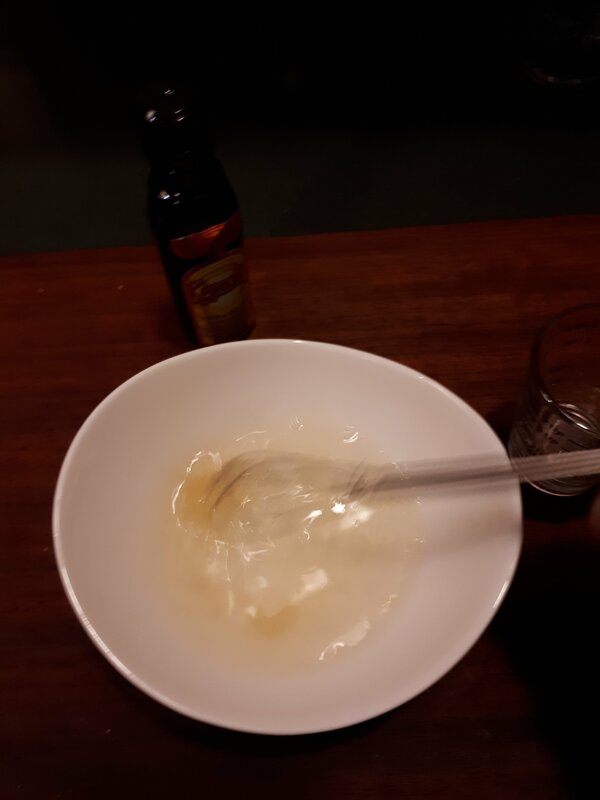 Mix dry ingredients very well. Mix wet ingredients well into dry ingredients. 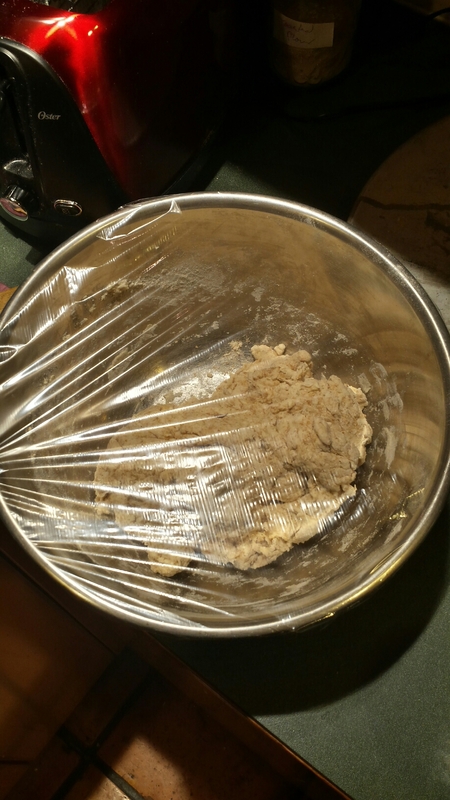 The dough will be very wet, more like a batter, about the texture of a pound cake batter. Spoon the batter into a parchment-lined baguette pan. Shape into a smooth loaf with the back of a wet spoon. Spread olive oil over top of loaf. Let rise for half- to one hour until sort of doubled. Bake 20 minutes in a pre-heated 450 degree oven. Spritz water onto the loaf in the oven every few minutes. If you love bread but have a sensitivity to wheat or gluten, there is definitely hope, as long as you don’t have a problem with bacteria being doused in isopropyl alcohol so that bacterial snot solidifies and is collected for your bread. You’re already cooking the life out of yeast cells. Can it be so bad that millions of bacteria died for your baguette? Like bread-making, any mugwump can do it. — Elizabeth David, “Pleasing Cheeses,” Nova, October 1965. I’ve baked bread as long as I can remember, first with my mother’s guidence and for at least four decades now on my own. Through high school I kept a sourdough starter alive, baking five smal loaves every Sunday as the centrepieces of the next week’s school lunches. Some might argue that I find baking bread to be one of the simplest of kitchen things because of this stupid long experience making the stuff. I would argue, however, that I feel this way because it truly is absolutely dead simple to bake a more than decent loaf of bread with little experience and less effort. 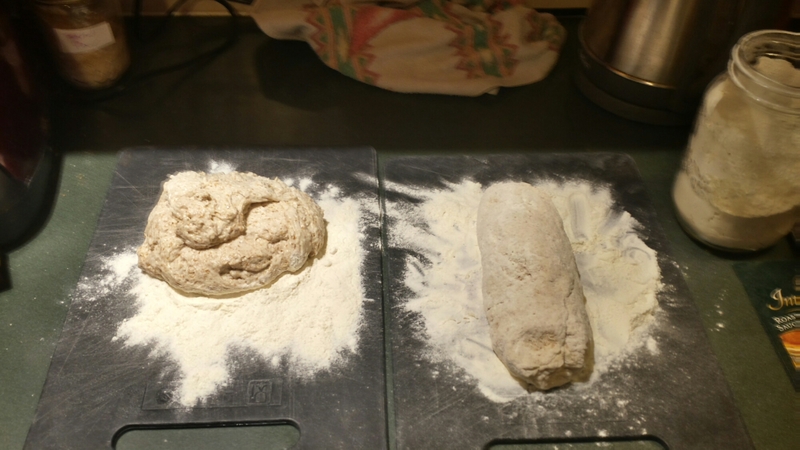 The other day I made a couple of loaves. No kneading. About three minutes of hands on effort. 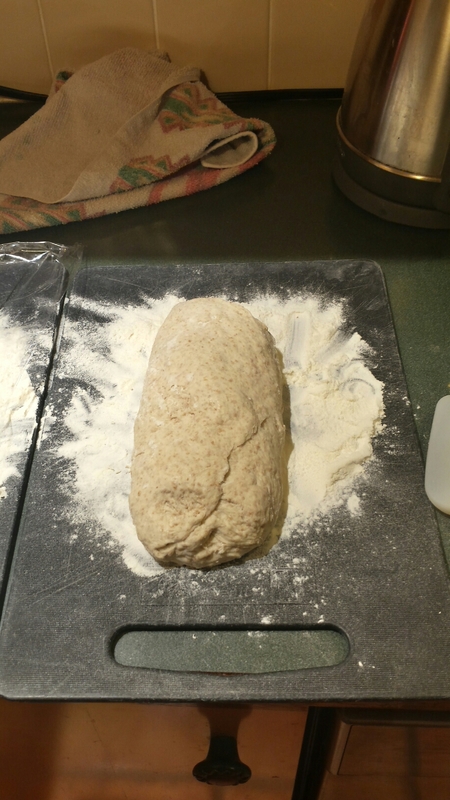 Lots of free time to do other tasks in and out of the house while ostensibly making bread. Cover the bowl with plastic wrap and go away for the day or go have a good night’s sleep. 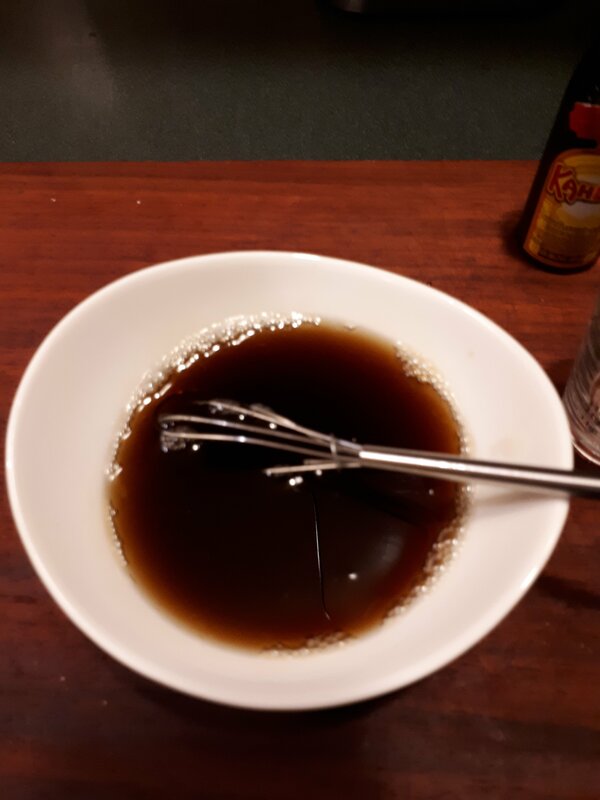 Whenever you get around to it, give it another quick stir. After an hour or two, divide the lump roughly in half and quickly shape the two bits into elongated lumps on well-floured boards. Cover with plastic wrap. Go away for an hour or two. 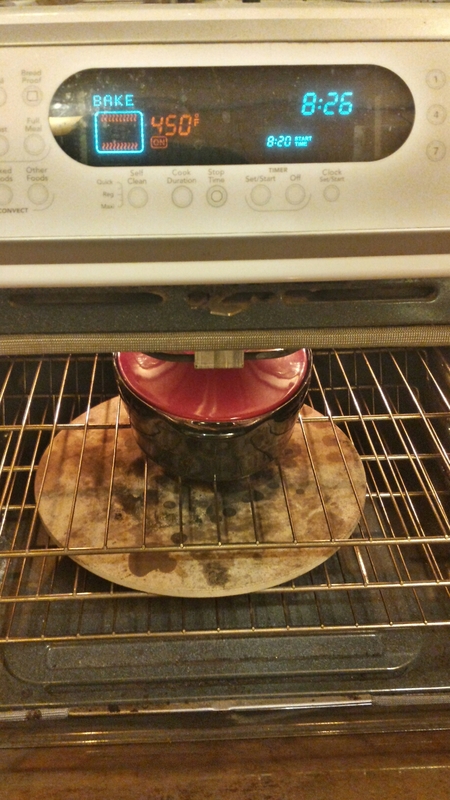 Put a couple of heavy cast-iron lidded casseroles or pots or something into the oven and crank it to 450°F. There’s only one in the picture because my sister-in-law had my other one. 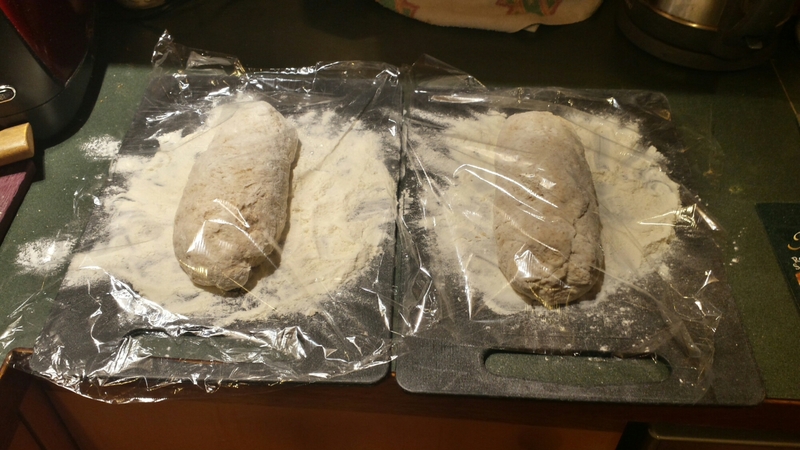 A while after the oven and the pots get hot, take the plastic wrap off the loaves, pull the pots out of the oven, take the lids off, sprinkle flour into them, flop the loaves into the pots, put on the lids and shove the lot back into the oven. 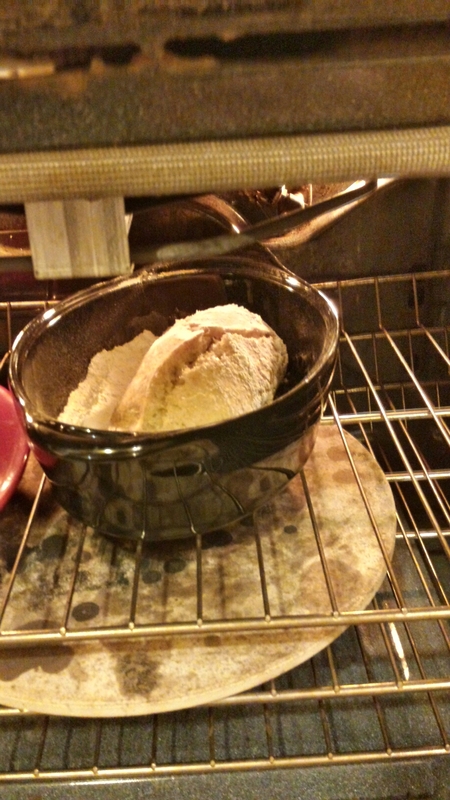 After thirty minutes or so, take the lids off and let the bread brown for five minutes. 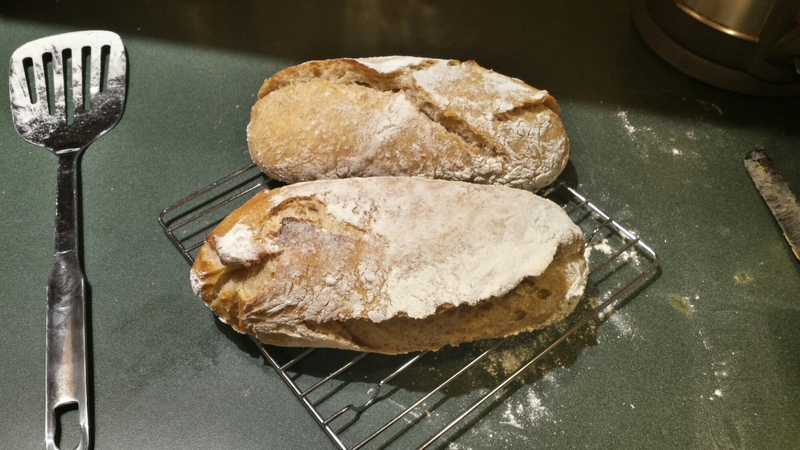 When the five minutes are up, take the pots out of the oven, lift each loaf out of its pot, scrape the flour off their undersides, and put them on a rack to cool, if you can wait to taste your newly baked bread! That’s it. Bread the easy, old-fashioned, no machine way. I’ve even baked this bread in a fire pit in my back yard (the cooking time was under ten minutes). To be honest, I don’t know why there’s any sort of market for bread machines. It’s pretty hard to be alive and not be aware in some sense of the U.S. Election. And for anyone who spends a bit of time on social media it would be difficult to be unaware of Donald Trump supporter Scottie Nell Hughes’ televised “Mazel Tov Cocktail” slip of the tongue Of course, the twitterverse exploded with fulmination and amusement and, eventually, recipes. Last night CBC Radio’s As It Happens even got involved. Well, I can play that game, too. 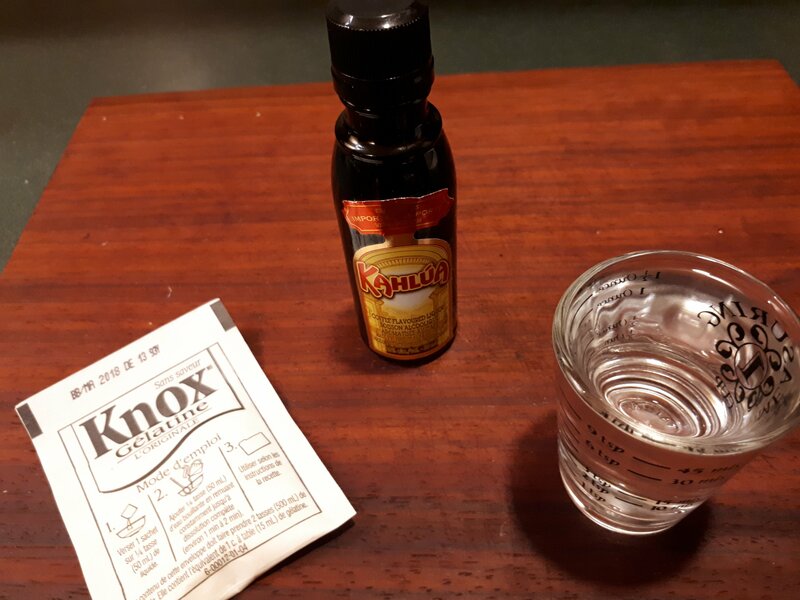 After some moments of historical thought, consideration of current events south of the Medicine Line, and ruminations on flavour, I’ve come up with my own Mazel Tov Cocktail along with justifications for each ingredient. Shake well in an iced cocktail shaker. Serve in tiny glass bottles with an outrageous weave of orange zest and a small sprig of rue. Manischewitz Concord grape wine is awful, sweet stuff on it’s own, but a necessary accompaniment for any Mazel Tov toast. 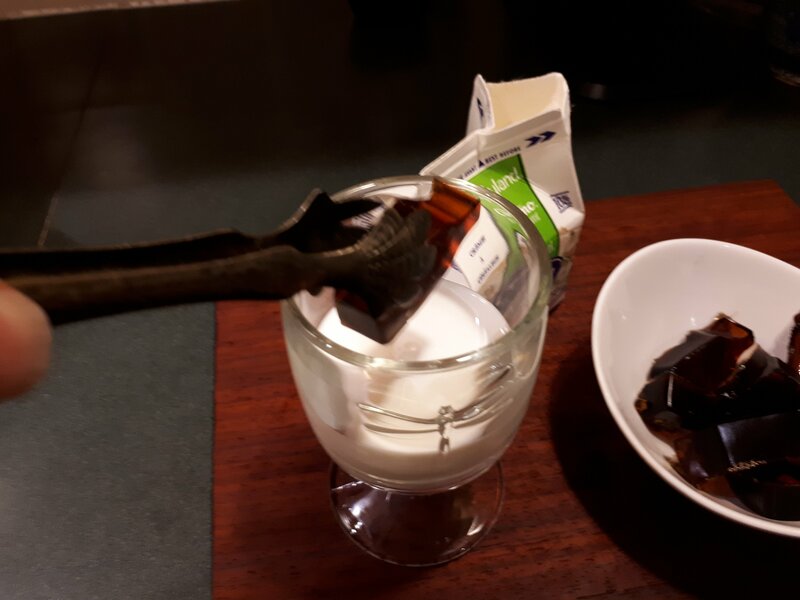 The improvised incendiary device known as the Molotov Cocktail was given its name by Finish soldiers during the Winter War against the Soviet Union. 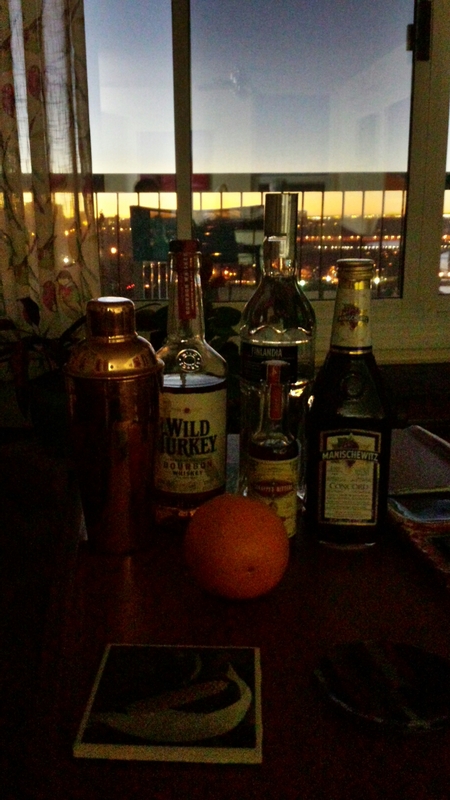 It seems only appropriate to give Finland a nod in my Mazel Tov Cocktail. Koskenkorva would be even better. The orange juice provides a necessary citrus balance to the grapey sweetness of the Manischewitz. It also is a cheap shot at a certain presidential candidate’s epidermal pigment challenge. The Wild Turkey Bourbon? Wild. Turkey. cf. above mentioned candidate. And his supporters. And I don’t think either the bitters or their orangeness need explanation. 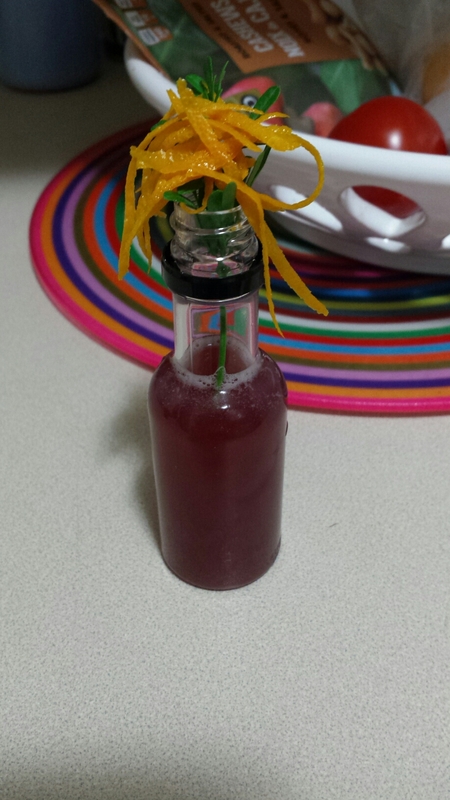 I think you see where I’m going with the garnish. Good luck with your election, neighbours, and Mazel Tov, America!